I was pretty dang excited to find this pretty little box in our mail recently, and couldn't wait to open it! I consider it a good day when we receive something other than a stack of marketing mailers sent to people who used to live at our apartment. Seriously, we still get mail for a ton of people, and they apparently spent a lot of their money on cruises, cigarettes and aquarium memberships. It's slightly bothersome. Lady Gaga Fame Perfume — This is a repeat item, which is odd. 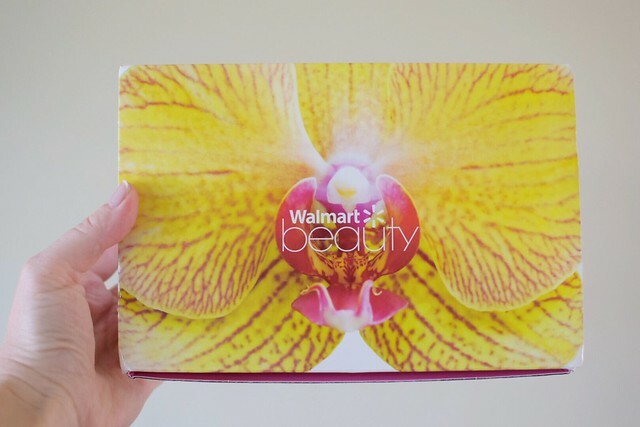 (I received the same thing in the Spring 2015 box, which I reviewed here.) I'll definitely use it, thought, because wearing actual perfume makes me feel like a fancy lady. Which I am not. Incoco nail art strips — There was a time in my life when I thought I could be someone who could wear nail art, but now I know that it's just not my thing. It's okay; I've come to terms with it. I've seen nail strips that are in pretty adorable patterns, and if these were in a pattern that appealed to me I may have tried them, but at this point I think I'll try them on Eisley (even though her nail beds are way smaller than the strips, so it could be a total nightmare trying to apply them...good luck and godspeed to me...). Goody SlideProof hair elastics — I am positive I received a pack of these in a previous box, but it must have been one that I didn't review here on my blog. We use them all the time, and they work exceptionally well (especially on my mom-style messy buns, as well as Eisley's super-long-hair ponytails) and we will add these new ones to our stash, but it was still a little bummed to see an obvious repeat in this box. Schwarzkopf Essence Ultime shampoo and conditioner — I always love trying new shampoo and conditioner products, so I'm sure I'll be using these at some point in the next month. They're specifically for colored or highlighted hair and claim to be "fast drying" and include "luxurious pearl essence" and "diamond gloss serum" (their marketing team is putting in some serious hours, you guys). I haven't had my hair color treated or highlighted in ages, but I'll still try these samples! Arm & Hammer Truly Radiant toothpaste — Another toothpaste sample for Jay's travel bag? Check. Vaseline Intensive Care lotion — Another lotion sample for the diaper bag? Check. Sally Hansen Airbrush Legs — This little sample is labeled "Leg Makeup" which I find hilarious. Are my legs the shade of printer paper, and feature their fair share of imperfections? Yes. Do I really want to start applying makeup to them in order to make them look better? Um, no. What is this madness. A variety of single-use samples and coupons were also inside the box, but nothing too exciting this time around. To be honest, this is the first time I've been disappointed by one of these boxes. There isn't one thing I'm genuinely giddy over, and there are two items that will get no use at all. By me, at least. (If you are in the market for leg makeup, you know who to call for a 0.75 oz sample.) The repeat items are disappointing, and it seems like the folks who organize these boxes could have been a bit more creative. Alas! There are worse things than spending such a small amount of money on something like this, only to be a little bummed by what I find inside. If you want to sign up for this beauty box (they ship four times a year—once every season—and you can cancel any time) you can visit the website here. As a reminder, I don't get anything if you sign up, and these posts aren't sponsored. I pay for all these boxes myself! I've enjoyed all the boxes up until this point, so I think I'll see how the next one is before deciding whether or not to cancel my subscription. At only $5 a box, it's hard to be too critical, but if there's more repeat items (or too many things I'll never use) in next season's box I will probably decide to cancel. Did you get this month's box? I know there are a couple versions, so I'm always interested to hear what other people received! 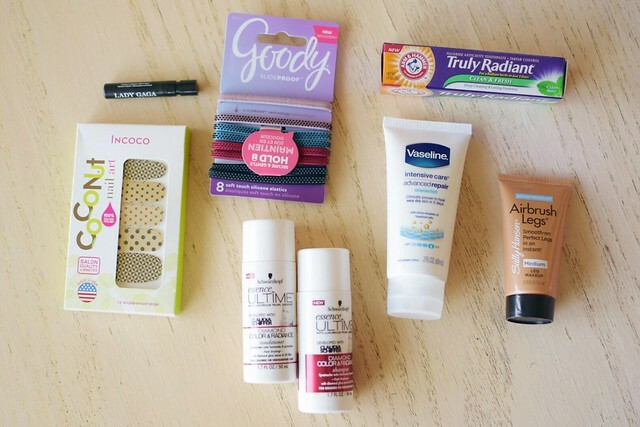 Those hair ties went out in the last Influenster box too. Apparently I'm hard on things because all the little rubber things fell off in a week. Not going to lie, though, I went to a wedding a few years ago and had this horrific bruise down my leg and leg make-up was my friend! I get the other version of the box (ahem, for older demographic I guess) and I was disappointed as well. So many repeats! I'm with you - one more chance and then I'll cancel. 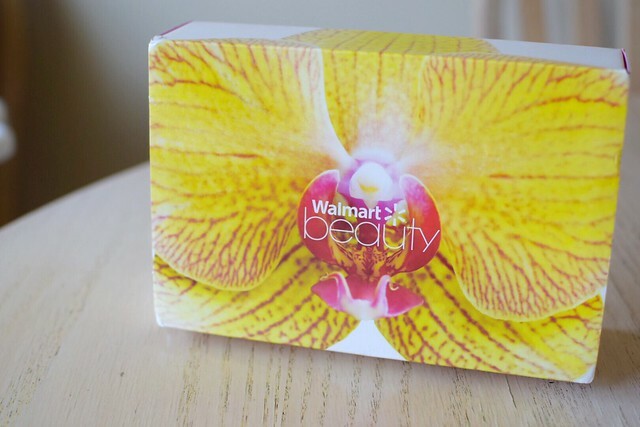 Thanks for reviews about this Wal-Mart beauty box. It seems fantastic. At local Chicago venues, I attended a fashion event and got many beauty goodies. All the stuff was really nice. Really enjoyed my experience there. This was my first time receiving a box, and felt a bit meh about it. I got most of the same things as you, except not the hairbands. I got St. Ives apricot scrub instead, which will be helpful when traveling. Yep. This was my 6th box or so, and those were definitely repeat items. I didn't mind so much on the hair ties because those are so super useful, but I'd rather have other new things I can try for the other stuff. I'm like you - I'll cancel if this becomes the trend. I wish I could spend my money on cruises! :) I'm interested in that shampoo, I'll have to take a look for it. I love new shower products.